A high number of bounces can hurt the deliverability of your emails. It's generally a good practice to run some kind of email verification tool on your list to help weed out bad email addresses. While running your list through an email verification tool does significantly reduce the total number of bounces it doesn't guarantee you'll see 0 bounces. 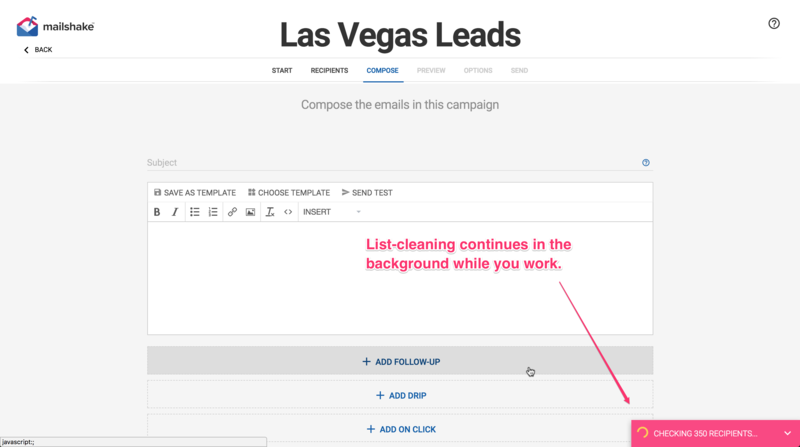 The list cleaning tool works best when your list doesn't contain a bunch of public domain emails (@gmail.com, @hotmail.com, @yahoo.com, @aol.com ... etc.) Public domain emails will almost always return with an OK result since the public domains typically always send a response when we check even if the specific email isn't working. Once list-cleaning is finished, the results will pop up for you to review. 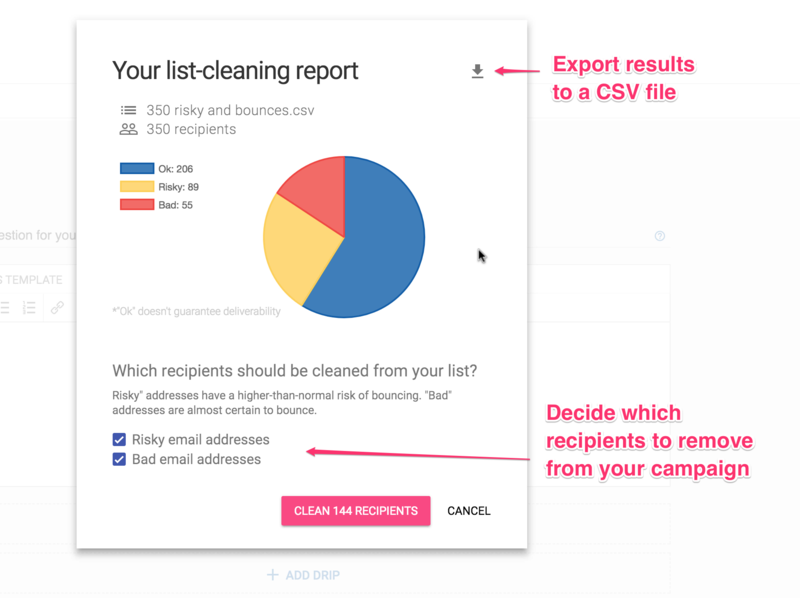 You can download the results to a CSV file for further review and you can remove risky and/or bad email addresses from your campaign. A "risky" email address is one that has a higher-than-normal risk of bouncing, but it's hard to say for sure if there's a problem. A "bad" email address is almost certain to bounce. Every team gets 500 free list-cleaning credits upon signup. 1 credit means you can run email verification on 1 address. After that, you can purchase 5,000 credits at a time for $10. 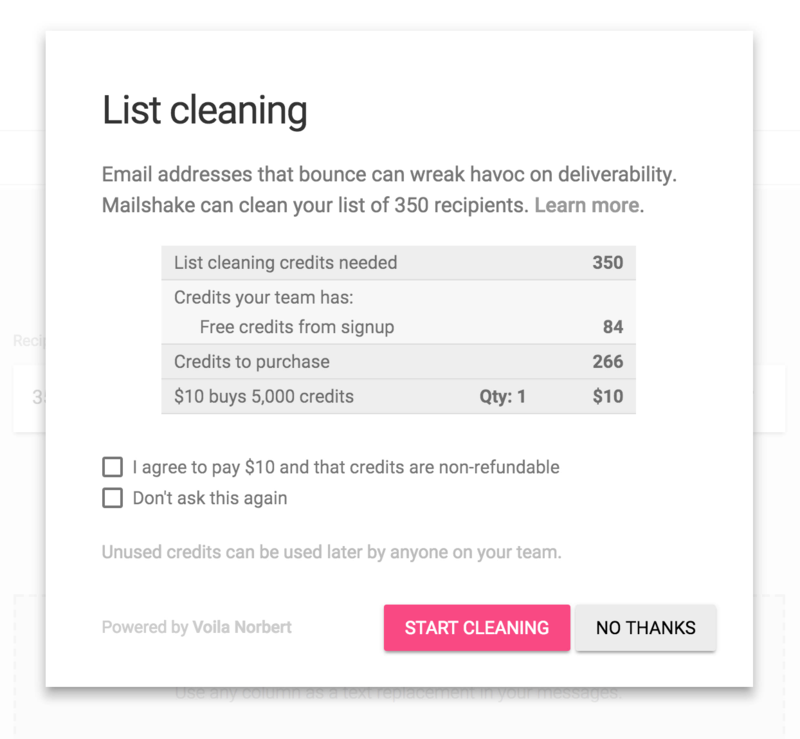 Running the list cleaner does NOT guarantee you won't see any bounces.